Last summer was quite an adventure. Not in the normal sense of the word; exploring new countries or traveling around the world. Instead, adventure happened in my own backyard, not too far from where I lived. From May to September, I led lake adventures on my brother and I's boat that we bought with some of the money we saved up. It ended up reaping huge dividends, creating community, making money and sharing my passion for the outdoors with others. 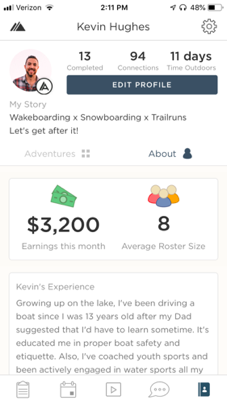 I met some amazing people, showed them the lake I grew up on, experienced countless sunsets, and earned $3,200 in a few months. It was epic! That summer I led 13 adventures with an average group size of 8-10 participants. However, it was far from an overnight success. It required proper planning, asking for a ton of help, failing forward, consistency, creativity, and above all else - patience. So, here are a few things I learned about leading a successful adventure. With those insights, I knew I could drum up some interest, cater to the group's energy and create and lead fun adventures. Since I was starting from ground zero, I invited friends and family to test out my adventure for free. This is a great way to get candid feedback from people you trust, enhance your experience and iron out the kinks. A simple way to get the ball rolling is to jot down a list of names of people you personally know who would be interested in joining your adventure. Friends, siblings, coworkers, even the neighbor down the street. Your early support system is everything. And if you're asking them for help, return the favor and show some love. Quick Tip: Doing the right thing is always the right thing. Cover the cost of the adventure by reducing your price, hook them up with a coffee, or surprise them with lunch on the house. Should we do an early AM wake-boarding session or a sunset run? Wake surf, go tubing or keep it simple and go for a cove swim? How about food and drinks? Would that be a good addition? I asked once, asked some more and kept asking until I understood what people actually cared about. With that feedback, I updated my adventure and set a reasonable price that I felt was fair to cover my costs. Saturdays and Sundays were deemed lake days and the word began to spread. After each session, I still asked for feedback and added new elements to my adventure like finding waterfalls, free photography, and a post-adventure BBQ. From the initial group of people who were willing to help me get off the ground, I asked them to leave a quick rating and review. This helped my adventure gain credibility, so others would know they were getting a good experience. It also allowed my adventure to be more discoverable and easier for people to find. I also asked the Adventure Aide crew for help. How should I price my adventure? How do my photos look and what platform should I promote my adventure on? I felt like I had my own support team guiding me along my journey, helping me optimize my adventure, and suggesting fresh ideas. 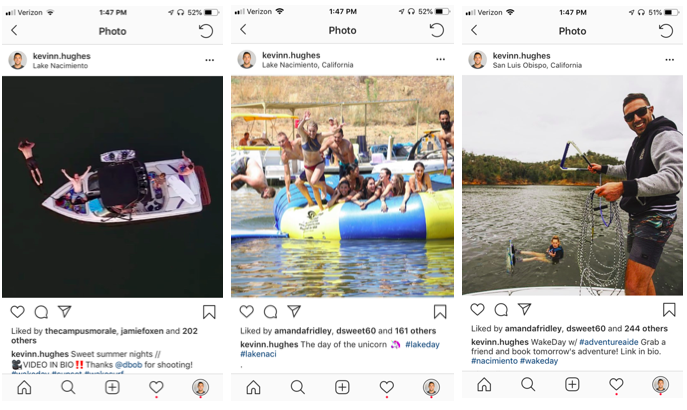 They helped my create multiple adventures like boat rides around the lake to find hidden coves, inner tubing while listening to a playlist designed by the guests, sunset cruises chasing the sun, wake-boarding lessons with the goal of “getting everyone up”. Bottom line, I provided options. People seemed to like that. Once my adventure was ready to go, I added sessions to my calendar and started promoting myself on social media. I posted my adventure share link on Instagram and Facebook and added a caption that described my adventure in detail. In my experience, it’s best to plan out 2-3 months of your availability in advance to give yourself enough time to promote. If I wanted to drum up some bookings, I knew social media was a great place to start. A few days before my session, I always post on my Facebook and Instagram pages letting my community know that I have a session up. Be sure to choose a photo that represents your adventure and add a caption showing people what you are all about. Add your location and include your adventure share link in your bio. That way people can click to read more about your adventure and then book it directly in the app. Facebook is a great place to post, tag friends and get your adventure discovered. Post on your own profile and tag a group of friends you think would be interested in going OR ask a friend to post on their wall. Either way, Facebook is a readily available platform to start promoting. To find your adventure share link, go to your Aide profile and click the "share icon" in the top right corner of your adventure photo. Copy the link and add it to your Instagram website URL or share to Facebook and create an inviting caption. 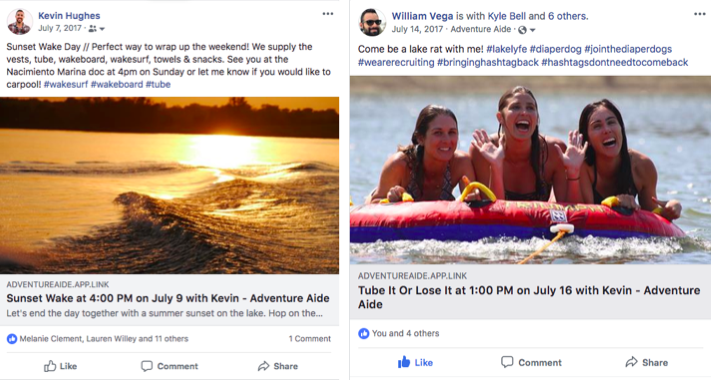 Quick Tip: Learn more on how to use social media to your promote your adventure. Check out the article below. Just start. Your adventure doesn't have to be perfect to get it up on the app. It will take some time to dial in, but I promise you it will be worth it as long as you keep your ear to the ground and truly want it to be successful. Include people in the process, add some "wow" moments, and just get after it! With enough brainstorming, making money doing what you love is possible and the opportunities and people that come along the way may surprise you. If you are ready to lead your own adventures, download the app and sign up below to become an Aide. The Adventure Aide crew is looking forward to meeting you and can't wait to help you with your adventure.